I was interested to read the renewed criticism of council newsletters this week, with Grant Shapps saying people should report authorities who they think are wasting public money on needless publications to the district auditor. In PR Week (which has a firewall, so no point in providing a link), he is reported to have criticised Labour councils for continuing to publish weekly newsletters, despite Government guidelines which suggest a limit of four publications a year. 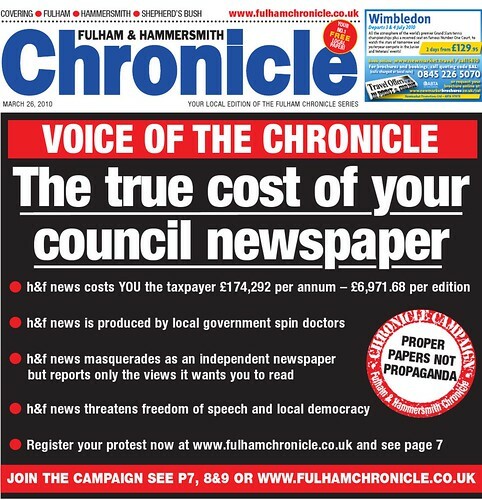 The excellent We Love Local Government blog has just posted ‘in defence of the Pravda’ (tabloid-speak for council newspapers). It actually started more like an attack, but read on and it highlights the fact that there are actually some good and some bad council newsletters. And the decent ones are valued by their residents. I’ve blogged about this issue recently, making similar points. They key point that councils need to demonstrate is whether residents value the newsletters they produce. Much of the research I have seen in my previous job suggests that they do. Communities Secretary Eric Pickles used the Conservative spring conference yesterday to speak about some of his priorities for local government. In his speech, he drew an interesting parallel with a Private Members Bill brought forward by Margaret Thatcher more than 50 years ago, which opened up council meetings to the press, and his challenge to authorities to be more open and accountable. Senior executive pay, town hall secrecy and the publication of council newspapers (or ‘town hall Pravdas’ as his speech writers call them) all featured in the conference address and a number of Labour councils came under fire too. A full version of his speech can be found here. It’s worth sharing a post on the Big Society – from Andy Sawford at LGiU. There is much more to say on this, as demonstrated by some Twitter exchanges I’ve had tonight over councils’ ability to send newsletters to residents. One man’s localism is another man’s fish and chip wrapper, perhaps. Sorry you can’t see the picture below. Problems with WordPress tonight. Amongst other blogs I have seen, Julian Dobson’s, Nat Wei’s and Matthew Taylor’s also caught the eye.